Africa, 1935, oil on canvas, 23 1/2 x 19 1/2 in. On loan. With a career spanning more than seventy years, Lois Mailou Jones devoted her life to ridding the world of race and gender prejudices by producing beautiful art. Born in Boston in 1905, Jones has always been involved with the arts. As a child, her parents often took the family to Martha’s Vineyard, where Jones experimented with watercolor and landscape painting. Jones studied at the School of the Museum of Fine Arts in Boston then moved to New York to work for a textile firm. In 1928, Jones took a teaching position at Palmer Memorial Institute in Sedalia, North Carolina, where she later founded the art department. In 1953, Jones married Haitian graphic artist Louis Vergniaud Pierre-Noёl. 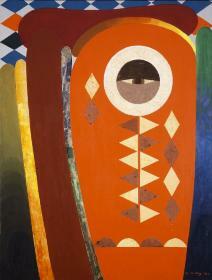 She made many trips to Haiti, which further inspired her to create more abstracted work. 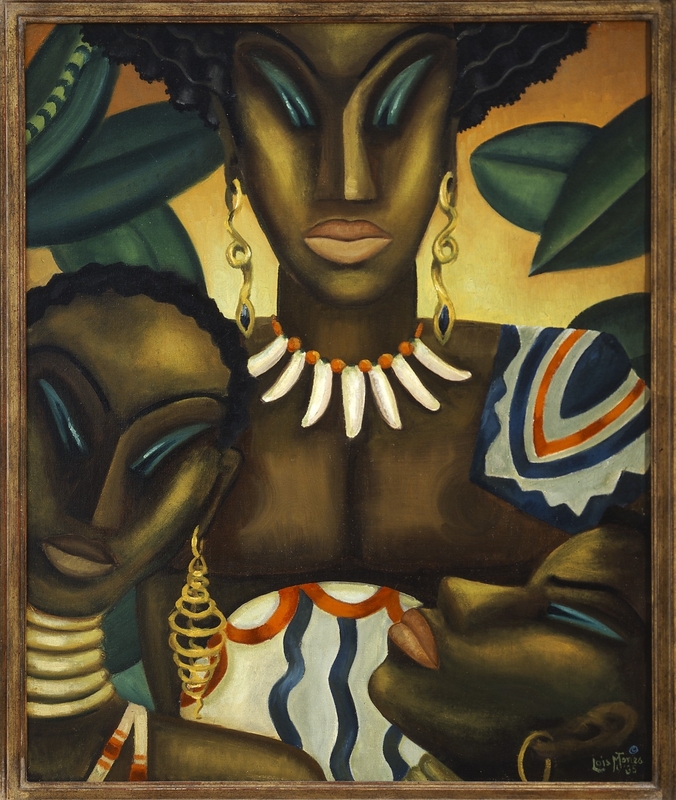 Jones’ paintings are in the collection of the Metropolitan Museum of Art, the Smithsonian Institution, the Museum of Fine Arts Boston, and the National Palace in Haiti. Jones died in 1998 but her work continues to be treasured and her importance as an African American artist and a woman artist recognized. Ode to Kinshasa, 1972, mixed media on canvas, 48 x 36in. Gift of the artist. This fall, NMWA will be featuring a major exhibition, Lois Mailou Jones: A Life in Vibrant Color, organized by the Mint Museum of Art in Charlotte, North Carolina. The exhibition will feature seventy paintings showcasing various styles of painting and experiences influenced by Jones’ life in America, France, Haiti, and Africa.